When Dominic Troiano left Mandala in 1969, he was looking for a change from the high class big band r&b rhythms. Along with Mandala-mates vocalist Roy Kenner and Pentti 'Whitey' Glan on drums, they moved to Arizona early the next year to get different musical vibes and a fresh start. They recruited bassist Parkash John and formed the band "Bush" in 1970. 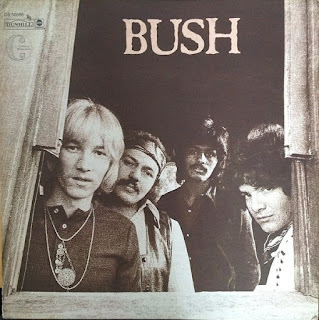 "Bush" soon began touring with "Steppenwolf" and "Three Dog Night". In 1970 released their first and only album was self-titled and like the band's name, straight forward, simple, catchy and easy. Tracks like the lead off "Back Stage Girl, "Got To Leave The City," "Messin' Around With Boxes" and their only single "I Can Hear You Calling" all showed Troiano and company were looking for a different direction, straight to the bones driving rhythms. By the spring of 1971, the band had very little money and only a small following. In June, after a gig at the Bitter End in Los Angeles, Troiano, Kenner, Glan, and John decided to pull the plug on Bush. Although Bush was history, Three Dog Night recorded the band's song "I Can Hear You Calling" and included it as the B-side of their own single "Joy to the World." The single turned out to be one of the group's best sellers.